Samsung has a couple of other surprises to share with its fans early next month besides the Galaxy Note 9. Two new products are likely to be revealed along with the company's flagship, a tablet, and a smartwatch. The Galaxy Tab S4 is supposed to be one of the most powerful tablets launched by Samsung to date, while the Galaxy Watch seems to be one of the more stylish wearables released by the South Korean giant. Since we've already seen what the tablet looks like thanks to a handful of pictures that leaked out not long ago, you may want to take a look at a short video that briefly shows the front and back sides of the Galaxy Tab S4. 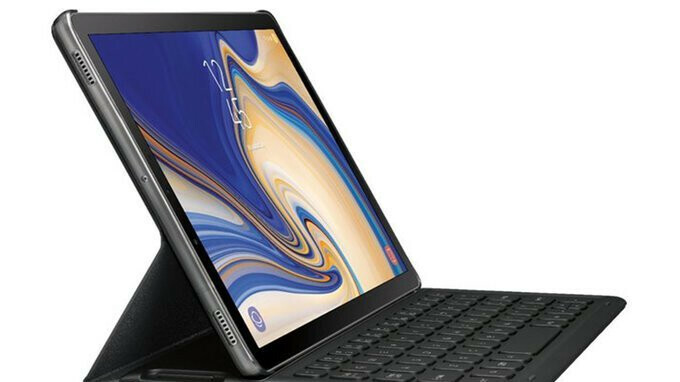 Both versions of the tablet – Black and Gray, are shown in the video, the only option that customers will have at launch if they want to pick up the Galaxy Tab S4. As far as the specs go, the hands-on video doesn't reveal anything that we didn't already know. But if you missed our previous report about the Galaxy Tab S4's specs, here is a quick rundown that will put you up to speed. First off, the tablet is equipped with a Qualcomm Snapdragon 835 processor, 4GB RAM, and 64GB storage. Also, it boasts a larger 10.5-inch Super AMOLED display with 2560 x 1600 pixels resolution. Finally, the tablet is powered by a massive 7,300 mAh battery and runs Android 8.1 Oreo right out of the box. Sadly, the Galaxy Tab S4 does away with the fingerprint sensor, but there are a 13-megapixel camera on the back and a secondary 8-megapixel snapper in the front. And I'm sure this will be on nobody's radar as most consumer, educational, and government users will be picking up an iPad for the best experience on a tablet. End of story. Have no problem with the experience on my s3 and would be interested in the s4 as well. This is a great tablet if you don't want the shortfalls of iOS. Wrong I'm not in the apple ecosystem like millions. I have the Samsung tab S 10.5 & need a 10.5" replacement so this looks like that replacement. This one will replace my 3 slow asz iPads that keep running out of battery. End of story. It can also replace your brain that keeps running out of battery too! I am sorry, but a tablet with 16:9 or 16:10 aspec ratio will never work as a productivity device. I just hope Google brings a nice ChromOS tablet with 4:3! I'm. Fed up of the 4:3 tablets, that's all that had been released in the last few years, for home consumers 16:9/16:10 is so much better for consuming video & photos. 16:10/16:9 is horrible for photos. Instagram and other social media enjoys 1:1 images, 35mm standard film format is 3:2, and most cameras are either 3:2 or 4:3. 16:9 is good for video, while bad for nearly everything else. Exactly! If you want it for watching video, this is probably one of the best devices (with OLED 16:10 display). But for nearly everything else it is just crap. Agreed, 16:10 is terrible for anything but video.